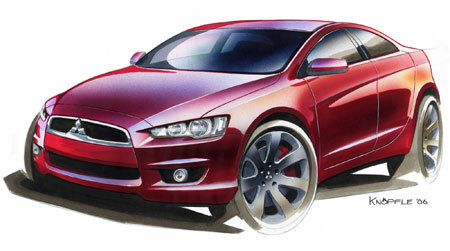 The next generation Mitsubishi Lancer sports sedan will be unveiled to the public at the 2007 North American International Auto Show in Detroit, to be held on January 13-21st 2007 at the Cobo Exhibition Center. The base engine will be a 1.5 litre 110ps engine in Europe, and the line-up will include turbodiesel models, as well as the eagerly awaited Evolution X model which will feature a 2.0 litre turbocharged gasoline engine. This dispels rumours about the next Evo coming with a larger engine to rival the Impreza’s 2.5 litre unit available in certain markets – a 2.0 litre it will be! The new Lancer sports sedan uses Mitsubishi’s Project Global platform, which shares chassis and engines with it’s partners DaimlerChrysler A.G., Hyundai, and recently PSA Peugeot Citroen. DaimlerChrysler’s new Dodge and Chrysler small sedans (example: the new Dodge Caliber) will be using the Lancer’s underpinings, while PSA Peugeot Citroen recently released SUVs based on the Outlander platform.